I have been using the ngl:: library for many years as part of teaching various graphic programming courses. I decided recently it would be interesting to port the core library and many of the demos to work interactively on the web using WebGL so started investigating a number of ways to do this. The main library is written in C++ and uses either Qt or SDL to create the OpenGL context. I had a number of choices as to which approach to take, I could learn Java Script and three.js however this would mean porting all my codebase to Java Script which seemed like too much work. My main development environment is a mac, however I have also tested the files under linux and it also works well. To get started I followed the tutorial here and all worked first time. The next stage was to try a simple WebGL demo that is provided with the examples. 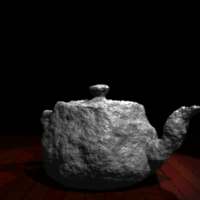 There are several WebGL demos using different libraries for OpenGL context creation however as I'm most familiar with SDL I chose to use this as the basis of the framework. The following code is a simple SDL program (very similar to a normal SDL program) the only difference is the call to emscripten_set_main_loop. The emscripten_set_main_loop function is explained very well here basically we create a function that is called asynchronously to allow the browser to regain control after every iteration of the function. It is important that this function does exit else the browser will hang up and I have had several times when I get a complete lockup of the system.